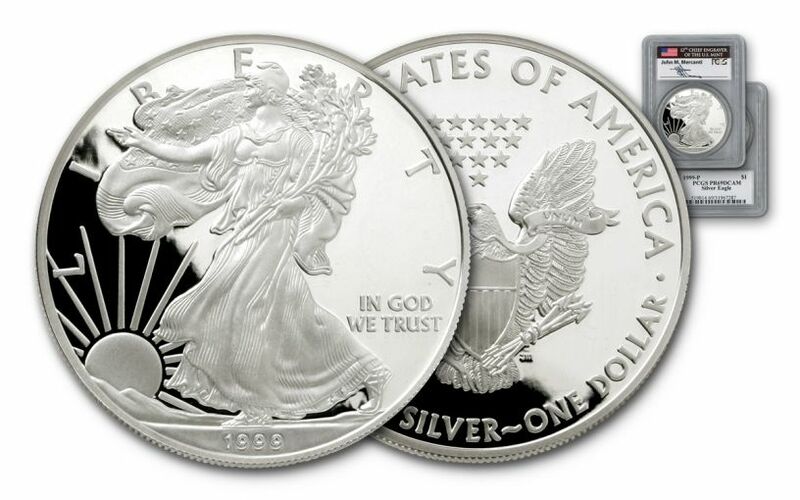 Serious silver collectors have been avid followers of the Silver Eagle series since it was first minted in 1986, and the extraordinary popularity of the coins has resulted in high volume mintages, particularly in the Brilliant Uncirculated forms of the coins. 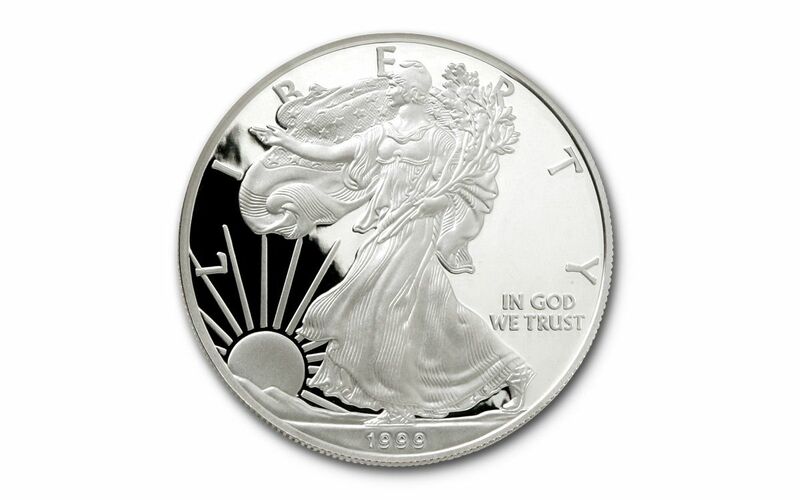 At GovMint.com, however, you can receive a 1999 $1 Silver Eagle that is a true original - and one minted at the height of Y2K hype, when concern over a potential international computer infrastructure failure had preppers stocking up on silver and gold. Our infrastructure survived, and this coin has stood the test of time as well, receiving the coveted designation of PR69 from the Professional Coin Grading Service (PGCS). In addition, its packaging is hand-signed by John Mercanti, former Chief Engraver of the U.S. Mint and one of the most important figures in the coin collecting world in the last half-century. The U.S. Mint only employed twelve Chief Engravers since 1792, and Mercanti has produced more coin and medal designs than any employee in United States Mint history. 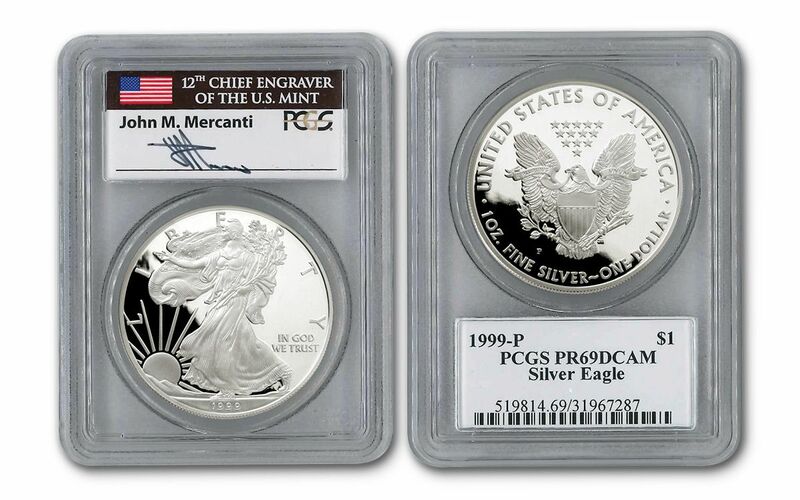 In fact, he's not only signed the 1999 Silver Eagle, he had a hand in designing it. The obverse of the 1999 Silver Eagle is iconic, featuring an image first popularized by Adolph A. Weinman for the beloved Walking Liberty Half Dollar (1916-1947). In this design, Lady Liberty strides confidently across a plain, backed by a rising sun. She extends one arm gracefully forward, and in the other grasps olive branches. Completing the design are the inscriptions "1987," "LIBERTY," and "IN GOD WE TRUST." The reverse of the Silver Eagle is a John Mercanti design. It depicts a triumphant eagle with wings spread behind a shield. The eagle is clutching an olive branch and multiple arrows, evocative of the Great Seal of the United States, and is surmounted by thirteen stars. The reverse's inscription includes "UNITED STATES OF AMERICA," "1 OZ. FINE SILVER - ONE DOLLAR," and "E PLURIBUS UNUM." This low-mintage proof coin has earned the designation PR69 because of its virtually "as struck" appearance, recalling the day it was minted in 1999 at the Philadelphia Mint. Containing 1 oz. of .999 silver, the weight of your coin is backed by the U.S. government, making this a practical as well as beautiful coin for serious collectors and silver stackers alike. Complete your collection today with a coin that survived Y2K, exclusively through GovMint.com!